Famine early warning systems are fundamental for anticipating and preventing food security crises. These systems require diverse socio-economic, climate and other environmental indicators. However, the uncertainty that is inherent in climate forecasts and other early warning data can influence the accuracy of early warning systems. Inaccurate forecasts result in ineffective preparedness and poor resource allocation. We present a replicable method to evaluate the accuracy of the Famine Early Warning System Network (FEWS NET) food security projections. The analysis was carried out for Ethiopia over the period January 2011 to June 2017. The findings show high levels of accuracy in the system overall which should give decision makers a high degree of confidence in using the information provided by FEWS NET. The results indicate higher accuracy in the western parts of the country and lower accuracy in the generally food insecure northeastern regions – likely due to insufficient information and high levels of vulnerability. In addition, we found a significant decrease in accuracy during the 2015/2016 El Niño, likely linked to the heterogeneous impacts from El Niño and higher levels of forecast uncertainty. The results also show mixed forecasting accuracy in situations of transition from food security to food crises and point to geographical areas where investments in early warning data collection and analysis would likely yield valuable improvements in the performance of the system. This research was carried out with the support of Tetra Tech International Development Services, a leading science-based consulting firm. Both authors declared that they have no conflicts of interest. Braimoh, A., Manyena, B. Obuya, G. & Muraya, F. (2018). 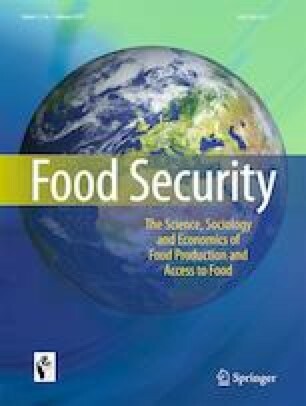 Assessment of Food Security Early Warning Systems for East and Southern Africa. Africa Climate Business Plan Series, World Bank, Washington, DC. World Bank. https://openknowledge.worldbank.org/handle/10986/29269 License: CC BY 3.0 IGO. Accessed 5 Mar 2019. Cabot Venton, C. (2016). The Economic Case for Early Humanitarian Response to the Ethiopia 2015/2016 Drought, Available at: https://static1.squarespace.com/static/5567b109e4b0101076d7f0bd/t/581b75e0cd0f68b05009b283/1478194658325/Ethiopia+Contingency+Analysis.pdf. Accessed 5 Mar 2019. Coughlan de Perez, E., van Aalst, M., Choularton, R., van den Hurk, B., Mason, S., Nissan, H., & Schwager, S. (2019). From rain to famine: Assessing the utility of rainfall observations and seasonal forecasts to anticipate food insecurity in East Africa. Food Security, 11(1). https://doi.org/10.1007/s12571-018-00885-9. FAO, IFAD, UNICEF, WFP & WHO. (2017). The state of food security and nutrition in the world 2017. Building resilience for peace and food security. Rome, FAO. Available at: https://docs.wfp.org/api/documents/WFP-0000022419/download/?_ga=2.172148192.254743601.1517331528-1003727597.1509551064. Accessed 5 Mar 2019. FEWS NET. (2015a). Ethiopia Food Security Outlook October 2015 to March 2016. Available at http://fews.net/east-africa/ethiopia/foodsecurity-outlook/october-2015. Accessed 5 Mar 2019. FEWS NET. (2015b). Ethiopia Food Security Outlook July to December 2015. Available at http://fews.net/east-africa/ethiopia/food-security-outlook/july-2015. Accessed 5 Mar 2019. FEWS NET. (2015c). Ethiopia Food Security Outlook April to September 2015 Available at http://fews.net/east-africa/ethiopia/food-security-outlook/april-2015. Accessed 5 Mar 2019. FEWS NET. (2016). Ethiopia Food Security Outlook February to September 2016. Available at http://fews.net/east-africa/ethiopia/food-security-outlook/february-2016. Accessed 5 Mar 2019. FEWS NET. (2017a). Food Insecurity Mapping. Available at: http://fews.net/fews-data/334. Accessed 5 Mar 2019. FEWS NET. (2017b). Global Alert: Very large assistance needs and famine risk will continue in 2018. Available at: http://www.fews.net/global/alert/november-28-2017. Accessed 5 Mar 2019. FEWS NET. (2018a). Hunger-related Mortality Likely as IPC Phase 4 Outcomes and Large-Scale Assistance Needs Persist. Available at: https://fews.net/sites/default/files/Food_assistance_peak_needs_2019.pdf. Accessed 5 Mar 2019. FEWS NET. (2018b). Agroclimatology: Analyzing the effects of weather and climate on food security. Available at: http://fews.net/sites/default/files/White%20Paper%20-%20Agroclimatology%20-%20Aug2017v2.pdf. Accessed 5 Mar 2019. FEWS NET. (2018c). Building rainfall assumptions for scenario development. Washington, DC: FEWS NET. Available at: https://fews.net/sites/default/files/documents/reports/Guidance_Document_Rainfall_2018.pdf. Accessed 5 Mar 2019. Food Security Information Network (FSIN) Resilience Measurement Technical Working Group. (2014). A Common Analytical Model for Resilience Measurement: Causal Framework and Methodological Options, Available at: http://www.fsincop.net/resource-centre/detail/en/c/267086/. Accessed 5 Mar 2019. Headey, D.D., & Ecker, O. (2012). IFPRI Discussion Paper: Improving the measurement of food security, International Food Policy Research Institute (IFPRI). Available at: http://www.ifpri.org/publication/improving-measurement-food-security. Rogers, D. & Tsirkunov, V. (2011). Costs and benefits of early warning systems. Global Assessment Report, United Nations International Strategy for Disaster Reduction. Available at: https://www.preventionweb.net/english/hyogo/gar/2011/en/bgdocs/Rogers_&_Tsirkunov_2011.pdf. WFP. (2016). WFP El Niño Response in Ethiopia. Available at: https://www.wfp.org/content/wfp-el-nino-response-ethiopia. Accessed 5 Mar 2019.